Back pain will affect 80 percent of humans at some point in their lives. It is the most common cause of job-related disability and a leading contributor to missed work days.¹ Sometimes leg pain and weakness can originate in the back. 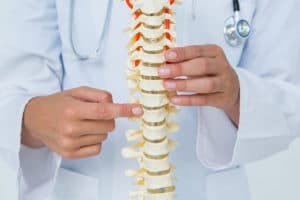 Fortunately, the majority of back pain will resolve itself in 6 to 8 weeks, but it’s important to determine if the pain is coming from a severe underlying condition. An orthopedist can evaluate the cause and recommend the best treatment for your particular condition. Your treatment plan should also include preventing a recurrence of your injury. Surgery is recommended only if other measures fail or the issue is severe enough. If you are suffering from back pain, please contact AppOrtho online or call (828) 386-2663. One of the most common causes of pain, this injury is commonly associated with poor physical conditioning. Muscle strain can affect people of any age or activity level. Treatment options: Exercises, minimal medication, or physical therapy. Symptoms: Degenerative arthritis usually causes back pain that does not radiate down the legs past the knees unless the spurs from arthritis compress the spinal cord or a nerve. The pain is usually worse with activity and when getting up from a sitting position. Treatment: Exercises, physical therapy, medication, activity modification and injections, or fusion surgery (rare). Injury or osteoporosis can cause spine fracture. Symptoms: Pain can be moderate or severe. If the fracture is displaced it can compress the spinal cord or nerves and cause radiating pain or nerve damage. The lower back, where most back pain occurs, includes the five vertebrae (bones) in the lumbar region and supports much of the upper body’s weight. The spaces between the vertebrae are maintained by round, rubbery pads called discs that act like shock absorbers in the spine to cushion the bones as the body moves. Most people have a bulging disc, and usually they do not cause a problem. Symptoms: When the disc compresses the spinal cord or nerve, radiating leg pain and or weakness can occur. Most disk herniation symptoms resolve without surgery. To diagnose herniated discs, an orthopedist uses an MRI or CT scan. Progressive weakness and bowel or bladder problems can be signs of a dangerous condition. Treatment options: Exercises, medication (steroids, NSAIDs), epidural injections, physical therapy, or surgery. Arthritis and disc problems sometimes cause narrowing of the spinal cord. This can occur if the bone spurs are large enough to compress the nerves or spinal cord. Symptoms: Numbness and weakness in the legs, usually with activity, that improves with sitting or bending forward. Pain in these joints on each side of your pelvis can be caused by arthritis, wear and tear or injury. Symptoms: Produces pinpoint pain in the low back that occurs with sitting and activity. It can be severe. Anti-Inflammatory Medication– Taking a medication such as Naproxen that reduces inflammation just like you would take a vitamin – twice a day with food and water – is a great way to help the body calm down and allow itself to heal, though this may cause stomach issues as a side effect. Physical Therapy – Physical therapy is a crucial part in recovery of a tendon tear or rupture. In order to regain motion and strength in the shoulder, one must perform exercises specifically tailored for their injury. Regaining strength takes time, and positive results should start after 4-6 weeks of physical therapy. Injections – A steroid injection done in-office can help reduce inflammation and calm down the injured joint. Usually, these injections can only be performed every 3-4 months in order to avoid any further damage to the joint. Relief can last anywhere from weeks to months. Arthroscopy – If you have a large or a small injury and it is not getting better with treatment, minimally invasive arthroscopic surgery might be an option for treatment and repair. Surgery – Chronic issues such as arthritis might result in the need for surgery. X-Rays, CT scans or MRI should always be performed before moving to surgery. Do you have joint and muscle pain? AppOrtho can help. Schedule an appointment with one of our highly skilled providers today.